Chances are every person reading this has some connection to hepatitis, or inflammation of the liver, which can lead to liver failure and death. Unfortunately, there are many potential causes of hepatitis. Excessive alcohol consumption can cause inflammation, as well as autoimmune disease, in which the body mistakenly attacks its own liver cells. Currently five major viruses (which happen to be unrelated) have been identified to cause liver failure, referred to as Hepatitis A through Hepatitis E. Due to the contagious and dangerous nature of these diseases, US schools often require Hepatitis A and B vaccinations. Hepatitis A can spread easily through contaminated food and Hepatitis B (HBV) through blood and other bodily fluids. These vaccinations are simple, cheap, and life saving. Unfortunately, Hepatitis C (HCV) lacks a vaccine. Despite a common prevalence and upwards of 200,000 known cases in the US a year, the disease is difficult to ward off. We use the word “known” specifically because thousands of other people may also be infected but show no symptoms while spreading the disease. There is, fortunately, finally a cure to Hepatitis C. A once-a-day pill taken for several months can eradicate Hepatitis C from a sick patient’s body. Sadly, the cost for that treatment ranges from $55,000 to $150,000! As a result, government health care providers can’t shoulder the burden and only tend to allow coverage for end-stage liver failure. In other words, after all the damage is done, and the patient is dying, they are finally eligible for a cure. Several things may happen over the next few decades; the government may choose to buy rights to the drug and provide it more cheaply. The price may fall naturally due to economy of scale and new production methods. However, in terms of eradicating the disease for the general population, what we really need is either a vaccine or a cost-effect therapy. Recently, with the renewed fervor surrounding cannabinoids’ medicinal potential, researchers have begun to test more applications of THC, cannabidiol (CBD), and other chemicals naturally found in cannabis. While the anti-inflammatory effects of CBD are well-established, the anti-viral properties are not. As a result, one research team studying general medicinal properties of CBD decided to test CBD’s antiviral capabilities against Hepatitis B and Hepatitis C in vitro/in lab environment. To do this, researchers cultured cells from the HepG2 2.2.15 cell line. This cell line naturally produces high levels of HBV and is often used to generate the virus for lab study of hepatitis. Likewise, researchers cultivated Huh7.5 cells that naturally produce HCV. Although the growing procedures recommended for both cell lines vary slightly, the basic idea is that researchers allowed cells to grow in plates for three days, with and without CBD at a 10 micro-molar concentration. To allow for positive controls, researchers also tested drugs know to disrupt production of each type of virus. Researchers introduced CBD through the liquid growing medium providing the cells basic nutrients. Essentially, CBD had no effect on HBV other than showing toxicity toward the cells that produce the virus. This did not surprise researchers. However, and somewhat shockingly, CBD also “inhibited HCV replication by 86.4% at a single concentration of 10 micro-molar.” This data immediately identified CBD has a potentially effective therapy. Now, armed with the knowledge that a small concentration of CBD can kill Hepatitis C, researchers sought to establish the EC50 and CC50 amounts of CBD for treatment. EC50 is the concentration needed to inhibit roughly 50% of the pathogen while CC50 is the concentration that will kill 50% of viable cells. Ideally, and as observed here, the amount needed to inhibit the pathogen is much less than the amount needed to kill cells, meaning that the drug works without excessive collateral damage and therefore represents a good therapy. 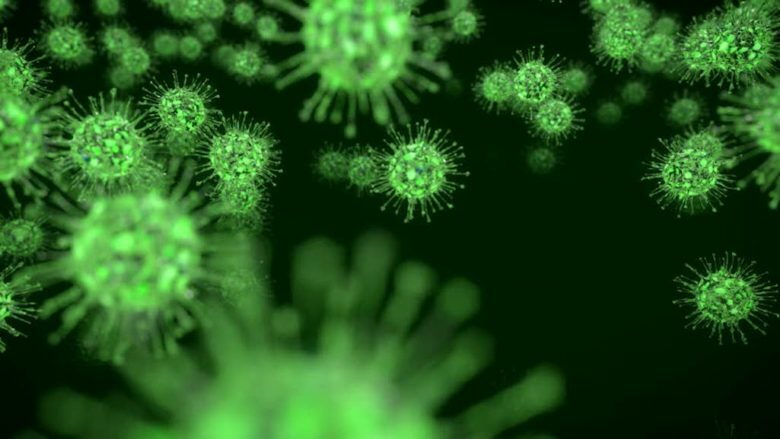 Additionally, through testing of various CBD concentrations, researchers also confirmed a “dose-dependent inhibition of the HCV virus”, suggesting that higher concentrations of CBD lead to greater virus-stopping power, as would be expected. Readers should be quick to note that this will not necessarily scale up in human treatment, and we may be wise to cite studies here that indicate little effect of cannabis in patients with Hepatitis C. However, recreational cannabis traditionally contains low amounts of CBD, meaning that these earlier studies are not necessarily relevant or conclusive. More importantly, its anti-HCV ability goes hand in hand with its natural ability to stop inflammation caused by autoimmune disease. Lastly, and most importantly, unlike currently available treatments, CBD can be produced very cheaply. Taken together, all of these qualities point to CBD as a great potential treatment or co-treatment for Hepatitis C.
Henry Lowe, Ngeh Toyang, and Wayne McLaughlin. 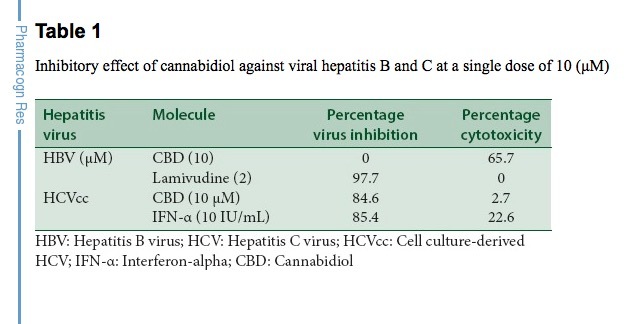 “Potential of CAnnabidiol for the Treatment of Viral Hepatitis”. Pharmacognosy Research (2017) 9(1):116-118. DOI: 10.4103/0974-8490.199780.